Document Camera | Zykanov Ed.D. Document Cameras are becoming more common in schools. The document camera adds usefulness to a digital projector and classroom computer. 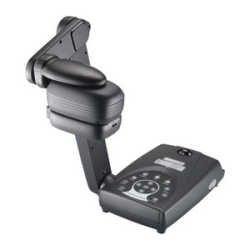 The document camera, quite simply, is a camera that captures and displays whatever is placed underneath it onto the class projection screen. It quickly makes the overhead projector a thing of the past. In my classroom I use this device in nearly every lesson. In fact, if it were to fail, I would have to quickly rethink how I present material to my class. It is very useful. Let me give you some examples of how I use the document camera through the day: In math class, my students begin the day with independent practice activities. If any of the elements of that work are challenging, require review, or are timely, leading nicely into our day’s math lesson, I put my copy of the activity pages under the document camera so that students can view it projected on the screen in our classroom. We work through the answers together, with students volunteering answers or me choosing students at random. Often my students have found novel ways of solving a problem, so they can bring their work over to show it under the camera and explain their thinking to other students. I also use the document camera to show students the materials they need to have out of their desks and ready for the lesson. I use the document camera to demonstrate use of the math manipulatives as needed for a given lesson. During reading class, I use the audio CDs provided by our textbook company so that students can read along or listen to background building audio over the sound system. The document camera allows me to project images from the reading text or other images, while they listen to the audio. Virtually every piece of work that we do together can be displayed on the screen, thanks to the Document Camera. In other subjects, such as science, I can show students flowers, rocks, plant parts, anything I want to show them in larger view so they can see details. As with most technology gadgets like this one, there are many more things I could do with the document camera if I had time or interest to learn how to do them. For example, I could save images and moving images taken by the document camera to play back at a later time. If you have other ways you use or have seen the document camera being used, please share them by posting a comment below. No need to purchase a big bulky document camera anymore. The Elmo MO-1 is compact, but powerful.